I’m always excited to share good news. And this time, I’m not only excited, but proud. The newest addition to the ICD Publications’ family of media brands, which includes Hotel Business, has won an award! InspireDesign, launched this year, is the winner of the 2018 Folio: Eddie Award for Best New Launch, B2B. It also received an honorable mention, in the same category, in this year’s Folio: Ozzie Awards. The prestigious publishing awards celebrate “uncompromising journalism and gorgeous design.” The Eddie Awards recognize editorial excellence, and the Ozzie Awards, outstanding creative design. A panel of judges narrowed the list of roughly 2,500-plus nominations to roughly 800 finalists, and winners were announced and celebrated at an Awards Gala at New York City’s Hilton Midtown on October 9. More than 350 magazine media executives gathered to honor the recipients. And Publisher Allen Rolleri, Director of Design & Technology Eliud Custodio and I were there to receive the award, on behalf of the super-talented editorial team you all know: Managing Editor Nicole Carlino; Senior Editor Gregg Wallis; Senior Editor CJ Arlotta; Assitant Editor Abby Elyssa; and Digital Content Editor Corris Little. What an honor to receive such an outstanding acknowledgment of our concept, execution and dedication to the InspireDesign brand. 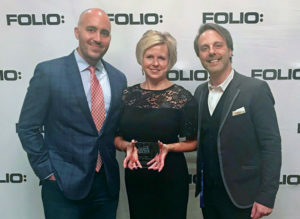 This award wholly validates our belief that this magazine—and its companion digital offerings—is a fresh approach to design inspiration and creativity. In launching InspireDesign, our mission was simple: bringing innovative vision for today’s hotel to our 17,000 readers, who are primarily hospitality designers. The magazine is published quarterly, and its core contents—inspiration, imagination, innovation, insight and process—aim to inform designers’ approaches to developing and executing highly aesthetic and functional projects. To see what all of the buzz is about, check out InspireDesign at myinspiredesign.com and on Twitter, LinkedIn, Facebook and Pinterest. And speaking of newly launched brands and industry buzz, our cover story introduces you to Best Western Hotels & Resorts’ latest offerings, Sadie and Aiden—described as edgy, imaginative and creative—with details provided by president and CEO David Kong to Hotel Business exclusively. Find out more—our cover story begins on page 16.